While the Utility companies today are directing call traffic to customer self-service to lower the call center volume, the need for call center agents talking to customers is still a big component of the Utility industry. Customers engage the call center agents for assistance with like move-in to a premise, bill inquiry, and sales quote. Therefore it is undeniably essential to have call center solution that will allow the business to run with simplicity for and agility to adapt quickly for changes in the industry. C4C Utilities supports the call center agent to handle calls from customer search, view premise information, to creating an installment plan. C4C Utilities provides support for the call center processes as well as the sales process, and such as is applicable for both regulated and deregulated utilities. Regulated move in process as well as the deregulated sales process for enrollment are both integrated to ERP IS-Utilities (IS-U). Performing a move in process for the regulated market will instantly create the contract for the customer and start service based on the move in date. Performing a guided sales process will create a quotation in C4C and kick off a switch document in IS-U to start communication with the market. See example screenshot below. 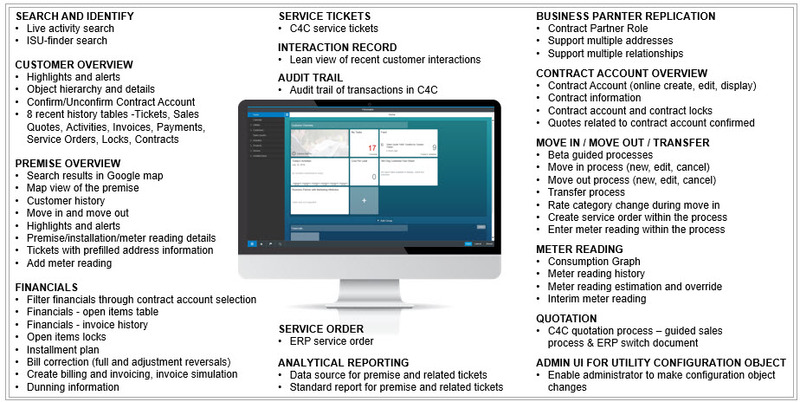 C4C provides new and enhanced functionalities on a quarterly schedule without interruptions to customer systems. 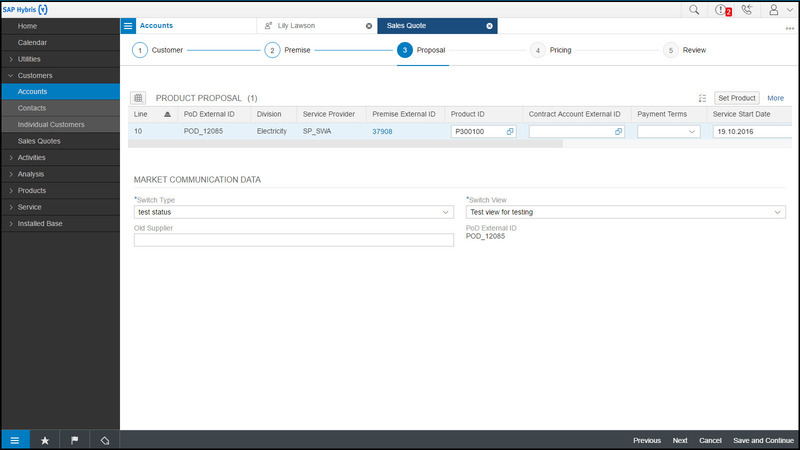 The contact center capabilities are fully integrated with IS-U and SAP ERP backend and support seamlessly transition between the different support channels. 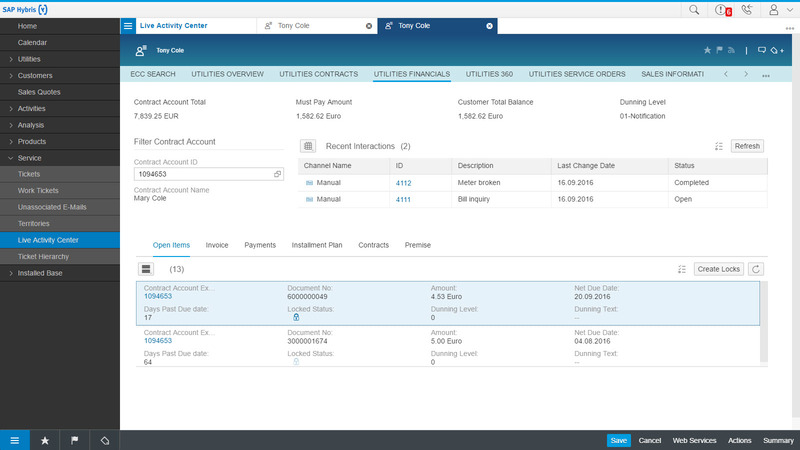 Using this set-up, all the utility services performed in this cloud solution are correspondingly updated in the ERP system. Now that the system is configured and set up, what does the call center agent see? Could you please share any documentation/details on the consumption graph for meter reads? Well its good that there is a C4C Utilities, this will be a very big help in order to support more with regards to handling the calls. For the agents it will be a lot more easy in their part when it comes to handling calls. Being a call centre agent is not that easy but because of the software and tools their life is becoming more easier and because of the technology they can be very more efficient and effective.